Yesterday I noticed the new headline on my Blogger dashboard "Attention FeedBurner Fans". Simply put, we can now indicate to Blogger that our RSS feed is really served by Feedburner, thus, leading to a more accurate account of the number of subscribers. Suddenly, the total number of my own blog subscribers jumped from about 12 to 84 subscribers (I've got more subscribers to the agregated feed...). That's quite an increase overnight! I can't be sure about it, but maybe there's some explanation to this sudden increase. 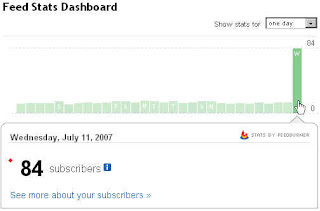 I started blogging in October of 2002, before RSS and Feedburner where really popular, and there was no ways of measuring subscriptions. Overtime, I changed to Feedburner but a number of subscribers stayed on the older feed. Again, it highlights how important it is to look at the trends, patterns and correlations rather than specific numbers. And to be cautious when comparing numbers even between similar blogs, sites, companies or industries. More info at: "FeedBurner Integration for Blogspot Blogs"